Ho, ho, ho! Are you looking forward to Christmas? I know I am. It's a busy night for me, of course, but I just love bringing presents to all the good little boys and girls. Speaking of presents, I heard you are worried because you haven't decided what you'd like most. Don't worry! I take last-minute requests. Also, lots of kids don't know what they want for Christmas. 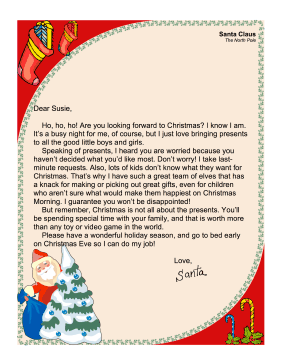 That's why I have such a great team of elves that has a knack for making or picking out great gifts, even for children who aren't sure what would make them happiest on Christmas Morning. I guarantee you won't be disappointed! But remember, Christmas is not all about the presents. You'll be spending special time with your family, and that is worth more than any toy or video game in the world. Please have a wonderful holiday season, and go to bed early on Christmas Eve so I can do my job!